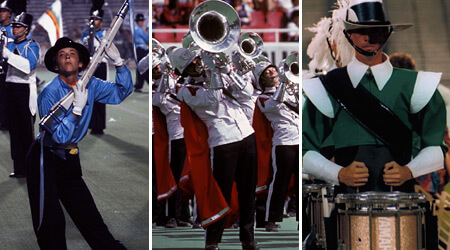 Drum Corps International is pleased to expand its offering of Video Performance Downloads (VPD). Just added to the collection, which debuted in July of 2007, are the fourth through sixth placing World Championship corps from the '70s, '80s, '90s and '00s. Made specifically to watch on your computer, VPDs can be easily transferred to a Video iPod or Apple TV. Available as Quicktime/M4V files, VPDs can be viewed on your computer in native 640x480 screen resolution and played on your computer through Quicktime or iTunes applications. and 1996 Cavaliers are among recently released VPDs. Each download costs $5.49 or $4.49 DCI.org's Fan Network Platinum Members. Keep an eye out on DCI.org in the coming months for additional VPD releases. Purchase VPDs from 1974-2006 today. Download a free VPD sample. View a list of frequently asked questions and technical requirements for VPDs.